Who should use the Bigger Faster Stronger readiness program? Although many athletes will be ready to jump right into the BFS set - rep system, others are more suited to starting with the BFS Readiness Program. Here are some examples. Auxiliary lifts are special exercises that are sport specific and help prevent injuries common in a sport. Chin-ups and lat pull-downs would be sport-specific exercises for baseball players because the latissimus dorsi muscles of the upper back internally rotate the upper arms. If you can’t measure it, you can’t manage it. If you can’t manage it, you can’t accomplish it. This is a motto BFS has employed right from the start, because we know that a key method of ensuring continual results is to have a goal every time you train. Bigger Faster Stronger (BFS) remains the premier training program for high school and college athletes. 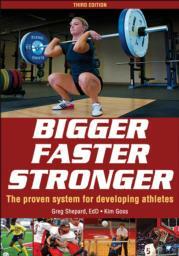 The third edition of the Bigger Faster Stronger book includes the latest research; training protocols for strength, speed, power, flexibility, balance, and agility; and new content on balance, safety, and plyometrics. Bigger Faster Stronger (BFS) is the premier performance program for high school and college sports. BFS and the book Bigger Faster Stronger have led teams to more than 500 state championships, and that was just the warm up. Now in its third edition, Bigger Faster Stronger is ready for the next generation of athletes and the next level of performance. Inside, you’ll find training guidelines for in-season and off-season weight training, as well as the latest strategies for breaking through plateaus, developing peak strength, and increasing power, flexibility, speed, and agility. You’ll learn the proper exercise techniques for the big four lifts, as well as multiple variations and safety protocols. You’ll also find recommendations for integrating new equipment, athlete monitoring systems, and other technology into your program to ensure maximum effectiveness and performance gains. Bigger Faster Stronger can accommodate any sport and every level of competition. Safe, effective, and relied on by thousands of athletes, coaches, and administrators, it is the proven performance program you can trust. The primary audience for Bigger Faster Stronger is high school coaches who work with athletes in all sports and are seeking BFS certification or recertification. The secondary audience is athletes of all levels. Greg Shepard, EdD, is the founder of Bigger Faster Stronger (BFS), the most widely followed strength and conditioning program in the United States. Providing strength training programs to high schools and colleges since 1975, BFS has a staff of more than 30 coaches, who conduct an average of 300 clinics a year and train thousands of coaches and athletes annually. Shepard’s BFS Magazine touts a readership of 500,000 coaches and athletes. Shepard has a master’s degree in exercise physiology from the University of Oregon and a doctorate in the same field from Brigham Young University. During his professional career, he has been a strength coach at Oregon State University, the University of Oregon, and Brigham Young University, where his powerlifting team won a national championship. He was also the strength coach for the NBA’s Utah Jazz from 1981 to 1997. At the time he was hired by the Jazz, Shepard was the only strength coach in the National Basketball Association. Shepard lives in Provo, Utah. Kim Goss, MS, PICP Level 1, has been a strength and conditioning coach and editor since serving in the Air Force from 1981 to 1985. He was the strength coach of the Air Force Academy from 1987 to 1994. While there, he designed all workouts not only for the football team but also for all 875 varsity athletes who used the weight room. Goss later ran a private gym and worked with numerous athletes who competed in the Olympic Games. From 1982 to 1987, Goss was a fitness and strength writer and editor for Runner’s World Publications. He has been the editor in chief of BFS Magazine since 2005 and an editor and researcher with the Poliquin Group since 2009. He has written over 700 articles and edited over 25 books. Goss earned a master’s degree in human movement science from A.T. Still University in 2009 and a bachelor’s degree in journalism and mass communication from Cal State University– Hayward in 1985. He lives in East Greenwich, Rhode Island.